The Game Boy has a pretty awesome sound processor. While unable to encode drum samples like the MMC-equipped NES cartridges, the sound has a bit more fiber, creating stronger music. A good example of this is Ninja Gaiden Shadow (1992), the prequel to Ninja Gaiden on the NES (where Ryu Hayabusa fights a servant of Jaquio, and in the NES version, Jaquio is merely the servant of another guy and so on). Anyway, the track is pretty cool and sounds a little like something from Capcom (though it was made by a composer from either Natsume or Tecmo). The beat here is pretty deliberate, a nice ninja shuffle, and that’s really a big part of what makes it memorable. It’s how videogame ninjas from the 90s moved. The composer is unknown, listed only as ‘Don’ in the credits. 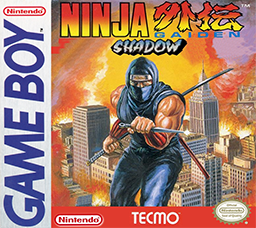 The game was originally going to be an adaptation of Shadow of the Ninja from the NES. 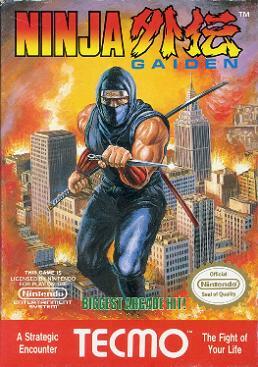 Yet another Ninja Gaiden game known only by the title, the Ninja Gaiden arcade game (1988) really has little to do with the NES games that followed. 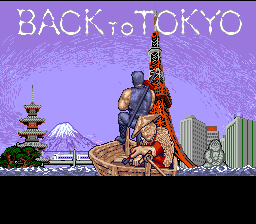 A rather poorly designed beat ’em up that gets kind of tedious, Ninja Gaiden mainly had character design going for it (pretty good and often funny design, I might add), with Ryu Hayabusa fighting all kinds of gangsters and hoodlums in America. The soundtrack is for the most part fairly generic, too, featuring chiptune covers of pop songs such as “Iron Man” and “Sukiyaki” (in fact, I’m surprised Taito doesn’t seem to have been sued over this). However, there are some notable pieces, particularly “Humming of the Devil”, the last stage theme. The soundtrack to Ninja Gaiden for the arcade was published in Ninja Ryukenden -G.S.M. TECMO (1989) along with the enhanced soundtrack to the NES game. It was composed by Mikio Saito (Metal Yuhki), Putaro, Ryuichi Nitta (Shitamachi Kajiya), and Angirus – though of course many of these tracks can be attributed to their original composers as well. Mikio Saito is the most prolific of the bunch, working under the pseudonym Metal Yuhki. 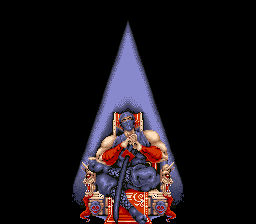 He left Tecmo in the early 90s to work for Konami, eventually composing the majority of the Tokimeki Memorial series, as well as working on some Castlevania titles, particularly Rondo of Blood. Ryuichi Nitta seems to have independent in the early 2000s after doing Gitaroo Man, and has since made soundtracks for Capcom and Konami. Practically nothing is known about the other composers. Ninja Gaiden (2004) for the XBox was a dramatic re-imagining of the series. Absent for a decade, Tecmo decided to re-establish the series through Tomonobu Itagaki’s special Team Ninja, using what Itagaki called the best hardware out there at the time, the XBox. 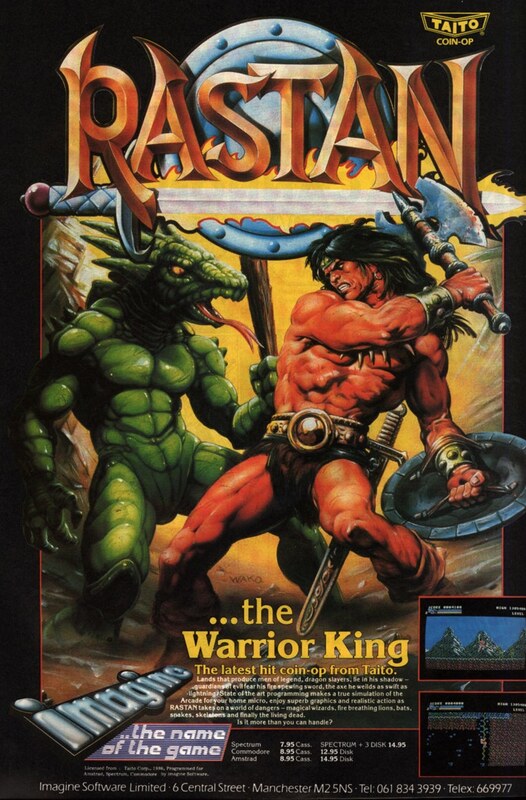 The game retained the series’ trademark difficulty and the character, but reworked it as a 3D action game with a brand new story and timeline. Instead of being set in contemporary Japan and America, the game takes place in the far future. Hip with bloody ninja action, the new series has a great style that’s also matched with its soundtrack. Coupling traditional Japanese instruments with electronica – each with high-quality audio – the end result is a type of modern techno that falls in with the game’s hip style; it’s very much a product of early 2000’s. 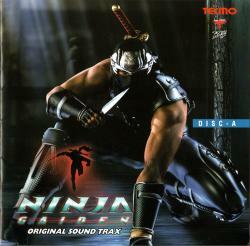 Even the album’s title – Ninja Gaiden Original Sound Trax – reflects this style. “Burn Away” by Makoto Hosoi is an excellent example of this atmospheric hipness. The instrument selection is chosen to provide a great sense of oppressive heat, bearing down on the listener yet also oozing into the game space through the choral line, which reverberates through the atmosphere. Fire themes often employ these types of instruments – heavy bass, brooding notes, and often metallic or weighty instruments. The track is also fairly minimalist, lacking melody and focusing more on atmosphere. As a result, it is something of a departure from the melody-driven originals, though more in tune with the orchestration and filmic/anime ideals of the 1990s Ninja Gaidens. “Burn Away” is also definitive of the blend of old and new that is central to both the re-imagining of the game as well as its setting. The wood percussion and flute provide a strong tie to the traditional while the synth lines (particularly the bass) and choral chanting provide a feel of the new. The Tokyo of the future reflects this old and new that is captured in the Japan of the present (particularly in Kyoto) – traditional parks, temples, and cherry blossoms find their place under the shadow of modern skyscrapers or crammed into blocks of apartment complexes. Though most of the songs on the album are atmospheric, Read the rest of this entry ? “Death of a Legend”, by Russell Cox, is another old OCR mix. 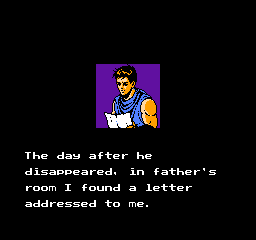 It is an arrangement of “Requiem“, the theme that plays after Ryu is forced to fight his father, Ken. Ken sacrifices himself to save his son from one of Jaquio’s fireballs. He spends the following two battles lying on the ground dying and afterward decides to go down with the castle. “Requiem” is a melancholic reunion, on the one hand containing the joy of seeing a father who we thought was dead, but on the other the shock and sadness of his sudden loss. There is a certain tenderness of a lullaby to this theme that grasps the father-son bond most tightly. “Death of a Legend” is an orchestral piece that imagines the scene unfolding in more detail, like a film, particularly with the breaks in the middle and the fading at the end. The theme plays six times, each with a different variation, beginning with the touching clarinet, then moving to the proud trumpets before adding strings and finally harp. Cox also adds new materials (1:04 and 2:29) that flow nicely with the rest of the theme. Sadly, the piece doesn’t really take the track to its full potential. “Requiem” plays as a response to the introduction theme “A Decision -Father’s Letter” Read the rest of this entry ? One of my favorite pieces from Ninja Gaiden is “Tragic Fate”, the battle theme of the fight between Ryu and his father, Ken. Ken has been controlled by Jaquio. The track is actually quite simple, with two short loops, the first repeated four times, the second repeated twice. Only seven notes for each section, it’s one of the shorter lengths typical of early games. 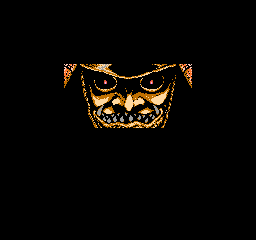 However, the composers of Ninja Gaiden were able to do something quite powerful with those seven notes because they knew they had to make every single one count. The urgency of the situation, Ryu’s love for his father, and the melody’s failure to coalesce into a complete whole capture the life-and-death struggle in the claustrophobic chamber. They cannot be reunited until the spell is broken… What is for Jaquio an amusing display is for Ryu a tragic struggle. 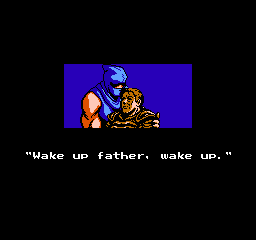 The scene comes as quite a shock because up until this point, the player has been unaware of the true fate of Ryu’s father, assuming he was killed in a duel. The best arrangement of this theme I’ve found (so far) is “The Mask” by Kilu. This is from VGMix 2.0 and is heavily midi, but the samples are pretty good and there is plenty of variation to . The piano is supported by a nice choral line, which gradually builds from there, with new instruments shifted in from drums and flute to trumpets, building to a nice crescendo. I feel the arranger could have done quite a bit more with this mix, but I guess this kind of illustrates the lack of decent coverage for this game (which is quite surprising, as it has so many popular themes). The game would require a wide range of coverage and can’t be limited entirely to one genre such as rock. Nario, Powellman, and Omnideth did another remix on Dwelling of Duels, but I feel a little disturbed by the crazy percussion! “Chaosium Sword” has been remixed a few times to varying effects. The official Ninja Gaiden II arrange album contained the first remix, “Herald“, using 90s synth rock and featuring thunder blasts that are so low-fi they sound they are coming from underwater. One of the most recent and best mixes is “Sinister Augury” by Ryan8Bit and Pingosimon from Dwelling of Duels (2004). That same year, there was also a remix album The Dark Sword of Chaos by Chromelodeon. I don’t have a copy of that one, but you can request it from that link to play on MagFest Radio. Most recently, there was a nice medley of Ninja Gaiden II music on Dwelling of Duels’ Ninja Gaiden Month (Part 2) by jaxx titled “I Am A Ninja” that ends with a nice rock rendition of “Chaosium Sword” beginning about 4:20. The recording is much higher quality than “Sinister Augury”, but doesn’t seem as well-balanced (probably why it got 3rd). 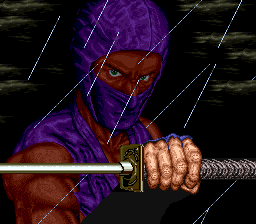 The Ninja Gaiden series that began in 1989 is a bit different from the modern Ninja Gaiden. While both games contain the same character and tough-as-nails action, as well as campy ninja vs. demon battles, the originals really set the stage for games in terms of production and presentation: they featured long cutscenes of the sort one might find in a Saturday morning anime, a well-crafted story, and top-notch music to orchestrate all this. Read the rest of this entry ?